The highlight of the zone meeting was a Demo-Off—each chapter brought their favorite physics demo, and chapters competed for laser-cut championship plaques. “I feel like as scientists we often forget to be amazed by the world around us, and this demo competition allowed each of us to be genuinely curious and excited about the world around us,” says Tori Eng, the 2017–18 associate zone councilor (AZC) for Zone 11. 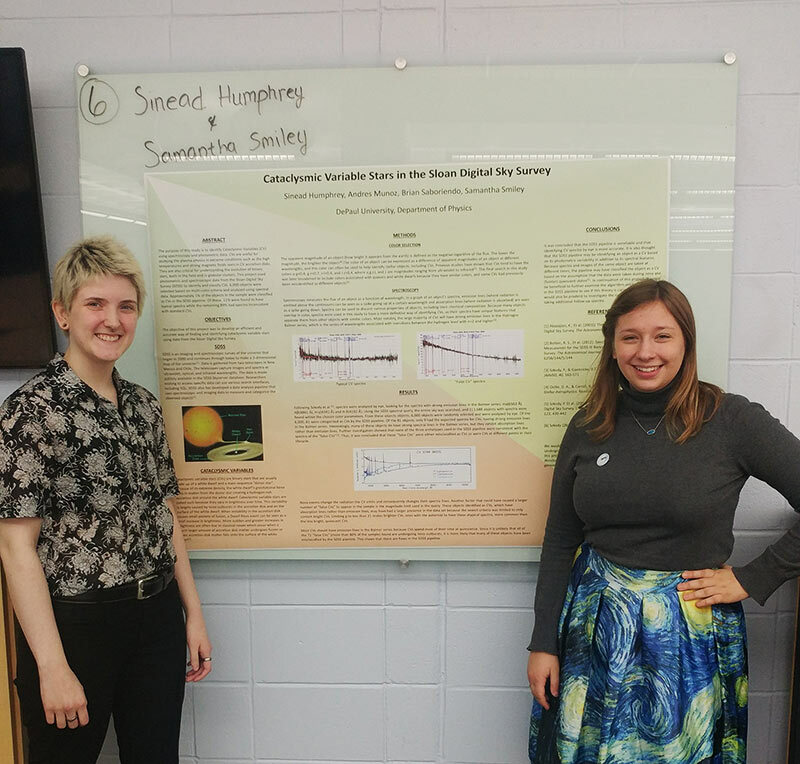 “Personally, I felt that this moment captured everything that is great about SPS, both the love of physics and connecting to others through that love,” she says. Meeting attendees pose during the poster session. Photo by Sam Pedek. Last year, Eng and Samantha Pedek, then AZC for Zone 9, teamed up to bring together students from across the upper Midwest for the joint zone meeting. 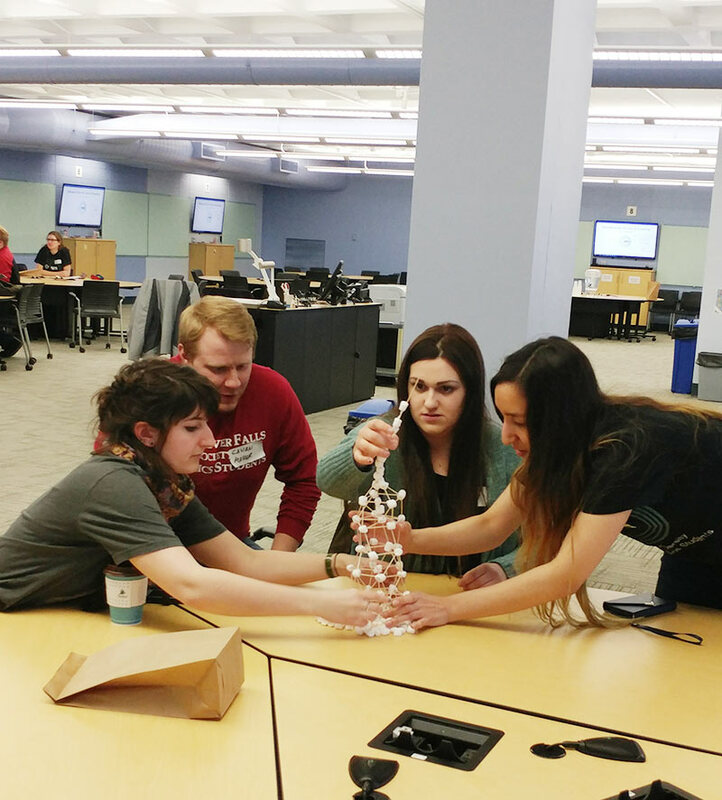 The meeting kicked off with an interactive tower-building competition and included zone breakout sessions, a trivia contest, tours of the labs at the host institution (the University of Wisconsin–River Falls), a poster session, research talks, and more. Hosted on the border between the two zones, the meeting facilitated interactions between nearby chapters that might otherwise travel in opposite directions for zone meetings. “Many chapters decided to hold meetups with nearby chapters and overall increase their connection with SPS both locally and nationally after this meeting,” says Eng. Another benefit of a joint meeting—twice the zones mean the possibility of twice the funding. This gave Eng and Pedek a larger budget to work with. Joint meetings can be a lot of fun, says Eng, but they come with extra challenges, too. She recommends that meeting planners be overly organized and communicate frequently. A website and online registration can be helpful tools once you’ve established the type of zone meeting you’d like to hold. For a thorough guide to planning a zone meeting, visit the SPS website at www.spsnational.org/meetings/zone-meetings. To receive funding support for your zone meeting, visit the SPS website at www.spsnational.org/meetings/zone-meetings/funding.